The FUELAB 529 Series Fuel Pressure Regulator works directly with our Prodigy line of fuel pumps to reduce heat build up and vapor lock conditions related to street/strip operation. Set the pressure mechanically like a traditional bypass regulator, then let the electronic regulator’s demand based speed control take care of the rest! 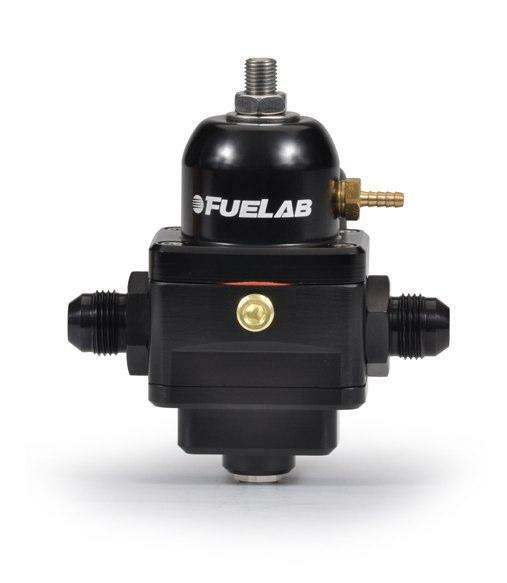 The Fuelab electronic fuel pressure regulator generates a signal to the Prodigy pump, to control the return line flow rate. This feature reduces current draw while at low engine output, to prevent fuel overheating that leads to fuel system failure. With the new FUELAB demand based system, true pump control is finally achievable and easy to install! Works with FUELAB’s Prodigy Fuel Pumps. Automatically reduces current draw at low flow demand. Monitoring capability to track actual fuel system capacity. Get the quick response of a mechanically regulated system, with the advantage of electronic flow control. Independent system, no other connections, control boxes or calibration required.